William Bigh : Surfriding in Tahiti, 1788-1789. Adjustments: 1/2° (degrees Farenheit) to 0.5 . Fresh Breezes and fair Weather with Showers of Rain in the Middle part. Wind at E. and E.N.E. and the Thermometer from 77 to 82. Fair Weather and a pleasant Trade Wind with some light showers of Rain and Lightning in the Middle part. Wind at E. & E.N .E. and the Therm. from 81 to 79. Fresh Breezes with Rain and Lightning in the Middle part and fresh Gales with heavy Rain towards Noon. Wind at E. and E.N.E. and the Therm. from 81 to 79. Fresh Breezes and Squally with Rain. Employed airing Sails and cleaning Ship. Wind at East and E.N .E. and the Therm. from 81 to 79. Squally with Rain and intervals of fair Wr. Wind from N .E. to E.B.S. Therm. from 81.5 to to 78. Moderate Breezes & Cloudy Wr. with much Rain. To Midnight the Wind at E. & E.B.N. when it varied to the southward and blew at West -the remainder of the day. Thermometer from 82 to 79. Ideeah, Tynah's Wife began a Strange conversation, which was how the Women of England were delivered of their Children, and as I complied readily with the knowledge I had of the matter, I was led to the same curiosity with respect to the Otaheite Women. One of her attendants seated himself in the Tent where we were and Opening his knees took her between them in a sitting posture with her legs under so as to rest upon her heels. His arms were brought round under hers, and his hands spread over the Upper part of the Belly, which they described were occasionally as the pains came on pressed downwards, and in this Manner the Mother was held untill the efforts of nature delivered her. I asked if no person came to assist in delivery. She said no, that was not proper, or indeed from her representation is it at all necessary for after a few distortions of the Countenance and trifling complaints the Infant was represented to be born. From her enquiries she found our English Women suffered much and had Assistance in the moment of labour, at which she laughed heartily. "Here," she said (placing herself in the posture already described) "let them do this & not fear and the Child will be safe." I was now asked if our Women had more than one Child at a birth, I told her frequently two, and sometimes three; three she said was eeno or bad, that some Otaheite Women had three Children, but that the Woman generally died and some of the infants. Moderate Breezes and fair Wr. with less Swell than Yesterday, but still much surf on the shore. Wind at E.B.N. and E.S.E. and the Therm. at 81 to 81.5. Having exposed myself much to the heat of the Sun and a dry scorching Wind, I was while at the Tents taken ill and continued in much pain for an hour. It was soon known among the Natives, and I was immediately visited by Tynah and several principal People besides a Number of Women, among whom were Iddeah and many others of consequence. The first part of this day Light Breezes and cloudy with heavy Showers of Rain, the Middle and latter more moderate and but few Showers. Wind E.N.E: to E.S.E. and the Therm. from 80 to 83.5. The Priest left off speaking and the Heiva began by the Men jumping and throwing their Legs and Arms into violent and odd motions, which the Women kept time with, and as they were conveniently cloathed for the Purpose, their persons were generally exposed to full view, frequently standing on one Leg and keeping the other up, giving themselves the most lascivious and wanton motions. As this was for some time performed at the farthest part of the Ring from us, out of compliment the Women were directed to come nearer, and they accordingly advanced with their Cloaths up, and went through the same Wanton gestures which on their return ended the Heiva which is called Opah. In the course of this extraordinary performance the Queen and Cheif Women were highly delighted, and asked particularly if we had no such Heivas in England. They felt no kind of shame. Altho it is a fact that no people. unless in these dances. are more cautious and guard their persons with greater decency. They have nevertheless a great want of delicacy. as the performances of certain actions is very frequently without any reserve the Topic of conversation. Wind at E.B.N. and E.B.S. and Therm. from 85 to 83. Large Swell and Surfriding at Matavai Bay, Tahiti, November 1788. The heavy surf which has run on the shore for a few days past has given great amusement to many of the Natives, but is such as one would suppose would drown any European. The general plan of this diversion is for a number of them to advance with their paddles to where the Sea begins to break and placing the broad part under the Belly holding the other end with their Arms extended at full length, they turn themselves to the surge and balancing themselves on the Paddles are carried to the shore with the greatest rapidity. As several seas follow each other they have those to encounter on their return, which they do by diving under them with great ease and cleverness. The delight they take in this amusement is beyond anything, and is of the most essential good for them, for even in their largest and best Cannoes they are so subject to accidents of being overturned that their lives depend on their swimming, and habituing themselves to remain long in the Water. They also practise with small Cannoes in these high surfs, and it is seldom that any of them get overturned or filled. Strong Breezes and fair Wr. with some light showers of Rain. Wind at E. and S.E.B.E. and the Therm. from 78 to 81. P.M. received one Launch load of Wood. Mending Sails and cutting Wood. It is not to be wondered at the strong desire the People here have for Axes, as they have acquired a most perfect use of them, and every person that has one belonging to them sets the highest value on it. ... chearfulness carried every billet of it to the Tents altho near half a Mile distant. Very Strong Breezes at E.S.E. with some showers of Rain. The Therm. from 78 to 81. Very Strong Breezes and cloudy Wr. with a few showers of Rain. Wind at E.S.E. and the Therm. from 77.5 to 79. Fresh Gales and Cloudy Wr. with some light showers of Rain. Wind at E.S.E. and the Therm. from 78 to 80. Fresh Gales and dark cloudy Wr. with much Rain in the Middle part and some Calms. The Wind at E.B.S. Variable to the N. W. and latterly at E.S.E. and South. The Therm. from 77.5 to 79. I experienced a scene of to day of Wind and Weather which I never supposed could have been met with in this place. The Wind Varied from E.S.E. to the N. W. and the Therm. stood between 78 and 81 to. By Sun set a very high breaking Sea ran across the Dolphin Bank, and before seven O'Clock it made such way into the Bay that we rode with much difficulty and hazard. Towards Midnight it increased still more, and we rode untill eight in the Morning in the midst of a heavy broken sea which frequently came over us. The Wind at times dying away was a great evil to us for the Ship from the tremendous Sea that broke over the Reefs to the Eastward of Point Venus, producing such an outset thwarting us against the Surge from the bank which broke over us in such a Manner, that it was necessary to batten every part of the Ship. In this state we remained the whole Night with all hands up in the midst of torrents of Rain, the Ship sending and rolling in a most tremendous manner, and the Sea foaming all round us so as to threaten instant destruction. ...Wind encreasing from the N. W. I gave up all Ideas but riding it out, and made the Ship as fit for it as possible. In this situation my Friends on shore became very anxious for my safety. All the Natives said the Pyheerahigh would be on shore, and my People at the Tents were not much less unpleasantly situated, for the Point on which they were became an Island from the Flood of Rain which had swelled the River to a great degree and the sudden influx of the Sea, which combined, the Plants became in danger, but this was remedied by Mr. Nelson and his Assistant cutting a passage through the beach for the River at a distance from the Tents, when their situation no longer became hazardous. The Sea broke in a very great degree on all parts of the Beach, Yet my Friend Tynah his Wife and Moannah came through it all to see me when I could not have supposed any Boat could have existed a moment. They were no useless passengers on board the Cannoe in which they came, each had their Paddle and the Sea was such as required them to be used with much Skill and dexterity; and not less risk to get into the Ship. The sudden change in my proceedings which will oblige me to leave these affectionate people gives me much concern. I had conceived I might have staid here untill the 25th of January at least, which answers to the 25th July in the West Indies, but I find I dare not risk it. From my enquiries hitherto I have found in general that the season now advances for bad Weather, yet I did not believe it. They even described to me that the Wind at times blows the Trees down, but as I had never seen any proof of it I had considered Matavai a secure place. In this I am very much mistaken, and recommend it to future Navigators not to lie here towards the Southern Solstice. Under these considerations I am determined to remove to Imeo for a secure Harbour, and shall complete and prepare the ship for putting to Sea with all dispatch. To Noon the Weather had little appearance of becoming better but the Sea was some what abated. Wind and Weather as Yesterday and the Therm. from 81 to 82. Light Variable Winds round the Compass and fair Wr. Therm. from 78 to 82. In the Morning the Weather became remarkably fine and we had less Surf on the Shore than we have seen in common, and I therefore took the Opportunity to send some Bread on shore to Air and clear of Weevils, about which we were principally employed. Fresh Breezes and fair Wr. with some Rain. Wind at E.S.E. and Therm. from 78 to 81. Fresh Breezes at S.E. and E.S.E. with Squalls and Rain. Therm. from 78 to 8O.25. In the Afternoon I returned from Oparre where are two Reef Harbours. The Westermost is the most convenient as a Ship may sail in and out of it with the common Easterly Wind, but as there is not room for a Ship to be sheltered from the N. W. I am apprehensive a very heavy Sea sets in when the Wind is in that quarter as well as at Matavai. The Entrance into this Harbour which is called by the Natives Taowne, may be known by a very uncommon & remarkable Mountain (called Wawry) which bears S.S.E. from it, and lies in a very extraordinary manner between the two principal high lands of this Part of the Island. It is about 6 Miles from Point Venus. The Eastermost or Toahroah Harbour is also small, but it is as secure as a Reef Harbour can well be. The Inlet is safe but not half a Cables length wide and about 4 Miles from Point Venus. The entrance being on the East side and deep water without it, is the only objection to this place, for with the common Trade Wind a Ship could not without much diffeculty & trouble get out. 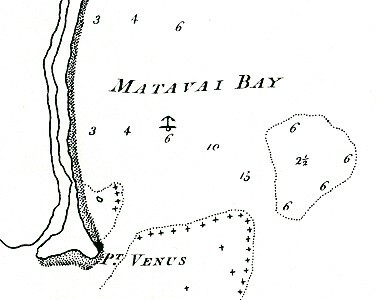 This Harbour may be known by keeping within a Mile of the Shore, after passing Matavai, untill you see the Reefs that form it, and the entrance, the South point having a Morai on it, but the Reef side is to be kept on board, and a look out kept from aloft if you cannot see the Shoal Water from the Deck. I shall however give fuller directions hereafter about this place. Fresh Breezes and Cloudy with much Rain towards Noon fair Wr. Wind E.B.N., S.E., E.S.E. and Variable. Therm. from 77 to 81. Moderate and fair Wr. with some Squalls of Rain. Wind from E.S.E. to E.N.E. and the Therm from 79 to 82. Towards Morning a long Swell began to set into the Bay and by Noon broke across the Dolphin Bank altho the Wind fresh off the Shore, the Sky also became very Cloudy. shoalest part of it creates a great Swell in the Bay with the Wind from the N.E. (Which I apprehend is the direction of it at Sea) and makes this a very unpleasant place to lye in at this Season. Second Large Swell at Matavai Bay, Tahiti, December 1788. Fresh Gales and dark Cloudy Wr. with heavy Squalls of Rain Thunder and Lightning. Wind at E.B.N. and the Therm. from 77 to 80. Employed about such necessary duties as can be done. This Afternoon I told Tynah that as the Weather was become unsettled and so much Sea run into the Bay, I should leave him very soon as it was unsafe for the Ship to ride here and therefore desired him to let me know what things he wanted to have done by the Forge and Carpenters and to send them on board without delay. Fresh Breezes and dark gloomy Wr. with continual Rain and much Thunder and Lightning. Wind at E., E.N.E. and N.E. Two Venereals in the List. Sailmakers employed about the Sails, and as I am now determined to sail in course of a few days if possible I ordered the Staysails to be bent. Fresh breezes at E. and E.N.E. and dark cloudy Wr. with much Rain and some intervals dry. The Therm. from 77 to 79.5. This Afternoon I sent the Master away in the Launch to sound and examine the Depth of Water and ground between One Tree Hill and the East harbr of Oparre. In the Evening he returned and reported to me that he found 16 and 17 fathoms Water with a good bottom all the Way. I therefore determined immediately of going into this Harbour and made the necessary preparations for taking the Plants on board. This Eastermost Harbour of Oparre is completely sheltered by the Reefs from any Winds and from the Sea. The Situation also is very desirable on Account of ye plants & Abounds with others in case any of those J have fail; for this Reason in particular as I beleive the ship will be equally safe as in the Harbour of Imeo, I have given it the preference. Remarks in Toaroah Harbour, Oparre. MODERATE WINDS AT E.N.E. DARK CLOUDY Wr in the Afternoon with some Rain but fair in the Morning. The Therm. from 77 to 80. First and Middle parts Modte breezes and Squalls of Rain, the latter a fresh Trade and fair Wr. Wind E.B.S. and E.N .E. Therm. from 82 to 83. Strong breezes and fair Wr with light Winds and calms in the Night & Morning. This is a delightful situation in every respect. I lye perfectly sheltered by the Reefs, with smooth Water and close to a fine Beach without the least surf on it, and I have therefore directed the Ship to be laid up and everything put below for the remainder of the time I stay in this Country, except I go to Imeo for Wood or for any unforseen Accidents. Tomorrow I ordered to be kept Christmas Day, and the People served Double Allowance of Grog. Fair Wr with Fresh Breezes in the day with some showers of Rain and light Variable Winds at Night. Therm. at 80 and 81. ... Airs and Calms in the Night. Wind at E.N.E. and the Therm. 79.5 to 82. Fresh breezes and fair Wr the first and latter part, the middle Calm and Lightning. Wind E.N.E. and the Therm. 81 and 83. The situation of Oparre is considerably warmer than Matavai, and for this reason, that lying within Point Venus the Trade Wind very frequently blows past it, and at any time never has it of equal continuance, whereas at Matavai you have generally a constant Wind unless Calm at Sea. First part fresh Breezes and Cloudy, Middle Calm and the latter moderate with very heavy Rain. Wind at E.N.E. and Variable to North. The Therm. 80 & 82. Squally with Rain first and middle part and Light Winds from the Land. Very Squally with much rain and some Calms in the Middle part. Wind E.N.E. and Therm. 79 to 81.5. Very Squally Wr and Rain with Thunder and Lightning. Wind E.N.E. and sometimes Westerly. Very Squally Weather with Rain. Wind E.N.E. and E.B.S. and the Therm. from 79 to 82. The weather so very bad we have had little Communication with the Natives, very few of them came to the Ship. Variable weather with some Rain Thunder and Lightning and blowing hard at times. Fair Wr with Strong Winds at Sea, and some Calms in the Night and a few light showers of Rain. Wind at E.N .E. and Therm. 80 and 84. Strong Breezes and fair Wr but the Sky much Streaked and threatens more dirt. In the Night, Calm. Wind at E.N .E. and E.S.E. Fresh breezes and Fair Wr. Wind E.N .E. Therm. 79 to 82. Strong Trade and fair Wr with Calms in the middle part with Lightning and som slight showers of Rain. Wind E.N.E. and Therm. 80 to 84. Fair Wr and Fresh Breezes at E.N.E. with Calm in the Middle part. Fresh Trade at E.N .E. with Calm in the Middle part and some showers of Rain. Strong Breezes and fair Wr with some Rain. Variable Weather with Calms, Rain and Thunder and Lightning. Fresh Gales and Squally weather with much Rain, Thunder and Lightning. Wind at East, E.S.E. and Therm. 77 to 80.5. A very heavy Sea set in on all the Reefs, and I could not at a better time have been in the Harbour of Ta-owne than passing it last night and to day, to know if there was bad riding in it. On the west part of the Harbour the sea rolled in over the Reefs and created some swell, but on the East and where a Ship might lye conveniently moored it was as smooth nearly as in this, and altho there was a Surf on the lee part of the Harbour, yet a boat might land without much difficulty, and I believe a Ship might lye here all the Year round with great safety. Since I have been here Matavai has shown itself to be a very dangerous place, a high breaking sea almost constantly running over the Dolphin Bank unto the Shore, and likewise over the Bank near to one Tree Hill where the sea breaks with great violence. Variable and bad Weather with Rain. Wind N.E., E. and Westerly. Variable Weather with Calms and a great deal of Rain. The Sea at Matavai still keeps up and a Ship would have been in a very unsafe situation to have been there since I left. Fresh Gales and hard Squalls with heavy Rain. Thunder & Lightning. Wind E.N.E. and E.S.E. Employed occasionally as the weather would permitt. Notwithstanding the wet Weather my People in very good health. The temperature of the Climate is very pleasant and agreeable and not that sultry heat which is commonly met with in wet Weather. Fair Wr with some light showers of Rain and Lightning. Wind N.E. and E.S.E. and Therm. from 80 to 83.5. Fresh Breezes and Cloudy Wr with Squalls and Rain at times. Untill Midnight Moderate Breezes and dark Cloudy Wr with Rain at times. Wind E.N.E. and between the N. and West. Moderate Wr with Rains, with fresh Breezes and Squally in the latter part. Wind Westerly, N.E., W. and E.N.E. The Therm. 77 to 80.75. Very Squally Wr with heavy Rain at times untill the Morning, then Cloudy. Wind E.N.E., Westerly, E. and E.N.E. ... with Intervals of fair W r.
Wind E.N .E. and Therm. 80 and 82. In the Afternoon I was detained at a House a small distance from my Post to see a particular Heivah performed by Women which Iddeeah told me I had never yet seen. I therefore waited the event which was only a Wrestling Match by Women of Attahooroo and those of Oparre. The manner of challenging and method of Attack is exactly the same as with the Men, but they differ from them in every other respect by being as savage as Wild Beasts; among the many degrees of Violence with which they endeavor to injure one another for life, is what is called gouging (in England but is now I beleive not practised) this is forcing the Thumb into the socket of the Eye and turning it out. My presence at this time prevented a circumstance of this kind, and as I could find no pleausre in such an amusement, I put an end to it and ordered them to leave off. When I spoke to Iddeeah and other principal people about it, that it was a disgrace to them, they laughed at me and said it was 'Myty Taheite' -it was customary in Otaheite. The Women not only wrestle among themselves but sometimes with the Men. Iddeeah is said to be very famous. Fair Wr the first and Middle parts with some light showers, the latter dark Cloudy Wr and some Rain. Wind N.E.B.E., S.E., N.B.E. Several Cannoes and Men and Women have been lost since we have been here in their excursions to Tetturaoh. ...much more plenty than on the Coast of Africa. I am told likewise there are a kind of Sword fish that as they vault along on the Water they peirce many people through the Body and kill them. They speak also of a kind of Fish like Bavia coota and attribute to them the same propensity, that of seizing the privacies of Men, as they are said to have in the West Indies. Fresh Gales and Squally Weather with constant heavy Rain. Wind N.W., W.N.W., W.B.S., and the Therm. 78 to 80.5. Page 301: Third Large Swell at Matavai Bay, Tahiti, March 1789. He returned with an Account that a great Sea broke all over it and that it would have been bad riding there for any Ship, and that a Great surf run on the Shore. Matavai is equally bad, but here we lye as smooth as in a Mill-pond. (t) Taowne Harbour (now called Taunoa) is about one mile westward of Toaroah harbour (left-hand lower corner of Chart on pages 260-1. Taowne is open to the N. W. and connected to Toaroah by an intricate passage through the reefs, suitable only for small craft. Light Variable Winds and much Rain. Moderate Breezes and Cloudy Wr, much Rain and at times Calm. The changes of the Air is very sudden sometimes it is exceedingly Sultry and Hot, and then in turn frequently Chilly, so that from inadvertency in their cloathing they become subject to those complaints. Light Winds with Calms and fair Wr. Light Winds and Calms, latter part Cloudy Wr. Wind N.E.B.E., E.B.S. and E.N.E. Fair Wr with Light Winds and Calms in the middle part. The Afternoon and Morning of this Day fresh Gales and Cloudy with fair Intervals, the night fair Wr and Calms with some flaws of Wind. Wind mostly N.E. and E.N.E. in the Night. Fresh Gale and Squally with some Rain the first and latter part, the middle less Wind, some Rain Thunder and Lightning. Therm. 80 to 84. .
Strong Breezes, moderating in the Night with Showers of Rain, Thunder and Lightning. Wind N., N.E. and E.N.E. Strong Breezes moderating in the Night with Showers of Rain, Thunder and Lightning. Fresh Breezes and Squally Wr with some Showers of Rain. Wind E.N.E. Therm. 80 to 83.5. The first and middle part Fresh Gales and Squally, moderating at intervals and some Showers of Rain, the middle part Light Winds and showers. Fresh Breezes and Cloudy Wr the first and latter part, the middle Light airs and Calms. Tinah is a very large man, much above the common stature, being not less than six feet four inches in height, and proportionably stout: his age about thirty-five. His wife (Iddeah) I judged to be about twenty-four years of age: she is likewise much above the common size of the women at Otaheite, and has a very animated and intelligent countenance. Iddeah was the general umpire, and she managed with so much address as to prevent any quarrelling, and there was no murmuring at her decisions. As her person was large, she was very conspicuous in the circle. Tinah took no part in the management. Upon the whole, this performance gave me a better opinion of their strength than of their skill or dexterity. The weather for some time past had been very unsettIed. This afternoon, the wind blew fresh from the N W, which occasioned the sea to break very high across the Dolphin bank; and in the night such a heavy broken sea came into the bay, that we were obliged to batten all the hatchways down, and to keep every body upon deck all night, though the rain came down in torrents. The ship rolled in a most violent manner. In the morning the wind increasing, and there being no possibility of putting to sea, we struck yards and topmasts, and trusted to our anchors. The river swelled so much with the rain, that the point of land on which the tents stood became an island; and, to preserve the bread-fruit plants from being endangered, the people were obliged to cut a passage for the river through a part of the beach, at a distance from the tents. The sea broke very high on the beach; nevertheless, a canoe put off, and, to my surprise, Tinah, his wife, and Moannah, made their way good through the surf, and came on board to see me. There was no other person in the canoe, for the weather did not admit of useless passengers: each of them had a paddle, which they managed with great activity and skill. These kind people embraced me with many tears and expressed their apprehensions for the safety of the ship. ... rably, but the wind continued to blow strong from the N W.
At sun-set, Iddeah went on shore, but Tinah would remain with me the whole night. The wood that we had got at Matavai being expended, I applied to Tinah, who sent three trees down to the water side before night, which when cut up made a good launch load. After breakfast, I walked with Tinah to Matavai, to see the cattle and the gardens. Tinah had already taken fo large a dose of the Ava, that he ,was perfectly stupified. Iddeah, however, was with us, and she is one of the most intelligent persons I met with at Otaheite. lddeah was very uneafy to-day, on account of her youngest child being ill.
... man, who she expected would come and tell her what to do. We had began to make preparations for sailing; and Tinah supplieu us with a sufficient stock of wood, by ordering trees to be brought down from the country. He had frequently expressed a wish that I would leave some fire-arms and ammunition with him, as he expected to be attacked after the ship sailed; and, perhaps, chiefly on account of our partiality to him: I, therefore, thought it but reafonable to attend to his request; and I was the more readily prevailed on, as he said his intentions were to at only on the defensive. This indeed seems most suited to his dispofition, which is neither active nor enterprising. If Tinah had spirit in proportion to his size and strength, he would probably be the greatest warrior in Otaheite: but courage is not the most conspicuous of his virtues. When I promised to leave with him a pair of pistols, which they prefer to muskets, he told me, that lddeah would fight with one, and Oedidee with the other. Iddeah has learnt to load and fire a musquet with great dexterity, and Oerlidee is an excellent marksman. It is not common for women in this country to go to war, but lddeah is a very resolute woman, of a large make, and has great bodily strength. He returned in 1788-1789, staying for five months, as captain of HMAV Bounty on a failed mission to transport breadfruit from Tahiti to the West Indies, culminating in the infamous mutiny in1789. Bligh was again dispatched to Tahiti in 1791, this time successfully completing the mission. On one of these occassions, Bligh is reported to have observed Tahitian surfriders using rudimentary craft. Compare and contast with Joseph Banks earlier account of Surf-riding in Tahiti, 1769. Jack Pollard Publishing Pty Ltd. Rigby Ltd Sydney 1977. page 1. "The heavy surf which has run on the shore for a few days past has given great amusement to many of the natives, but is such as one would suppose would drown any European. The general plan of this diversion is for a number of them to advance with their paddles to where the sea begins to break and, placing the broad part under the belly, holding the other end with their arms extended full length, they turn themselves to the surge and balancing themselves on the paddles are carried to the shore with the greatest rapidity." McGinness follows with several deductions. The sport was very crude in those early years. Only in Hawaii did surfing develop significantly. Geoff Cater (1997-2007) : William Bligh : Surf-riding in Tahiti, 1788.